The Mettler-Toledo ME54TE analytical balance has a capacity of 52 grams and a readability of 0.1 milligrams with a pan size of 90 millimeters (3.5") diameter. 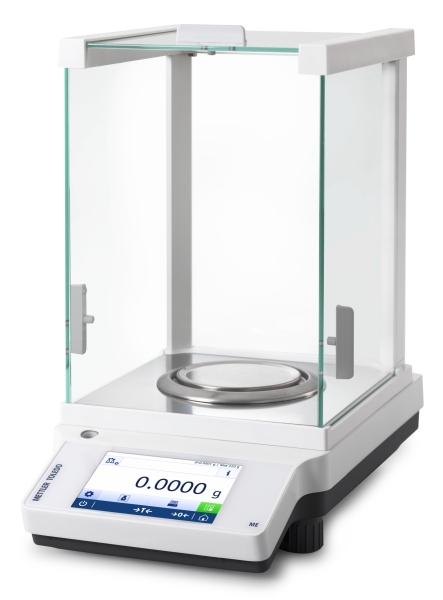 Mettler-Toledo ME-TE Analytical Balances provide Essential Functionality and Solid Performance. Every lab needs a balance that combines essential weighing functions with ease of use to deliver accurate, reliable results day after day. METTLER TOLEDO's ME-TE analytical balances are ideal for your lab’s sensitive yet routine weighing procedures. An intuitive touchscreen makes daily tasks as simple as possible while built-in features give operators everything they need to weigh with the accuracy, repeatability and traceability required. The metal base and a high quality finish make ME-TE robust enough for tough environments and the smooth surfaces make it easy to clean. This precise scale is built to perform - and last!